It seems a shame to paint such a lovely natural wooden bead but the colors are so nice. 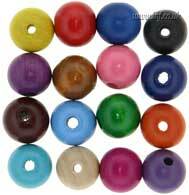 A 12mm plain painted gloss varnished wooden bead available in a range of colours. Approximate hole size 1.5mm.